Happy New Year to all my followers and fellow bloggers! New Year’s Day in the Greek Orthodox faith is celebrated with the celebration of St. Basil and the cutting the Greek bread, “Vasilopita” . St. Basil the Great is observed on January 1 and is also celebrated and all names of friends and family like our Bills, Vasili, Vaso,and Vickys. St. Basil is one of the three great church hierarchs along with St. John, and St. Gregory. St. 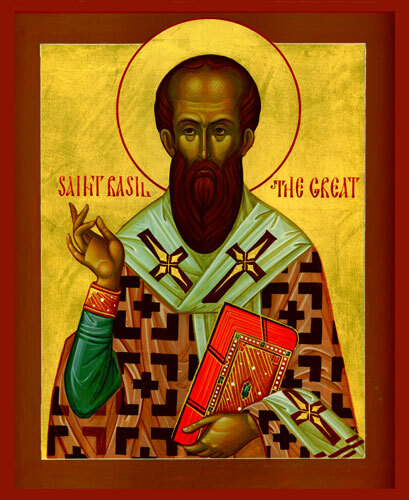 Basil worked as a missionary in the fourth century as a missionary, monk, and philanthropist. The bread is in his honor, along with the gifts, and special songs and the cutting of the bread. and give one slice to me! To all my listeners, followers, and family, thank-you for watching, listening and cooking along with me these past few years on my blog. It’s been exciting exploring beliefs, religious holidays, and trying to better understand all the Greek traditions we have held on to here, in America for so many generations. And to everyone in Greece who have made my travels to your towns and cities such a deeply unforgettable educational experience, so that I may come home and write about my culture with enthusiasm and meaningful words.